The work of CeRDI involves, to a large degree, the facilitation of open data access and the development of tools in eResearch to support this. While technology is the defining feature of CeRDI, technological innovation research moves beyond a simple examination of the use of technology for service delivery. Technological innovation research refers to the building of new knowledge around technological discoveries and applications, including in the areas of spatial mapping and knowledge management. Leading the development of effective tools to maximise accessibility, relevance and usability for the researcher and broader community in areas such as data federation, interoperability, 3D visualisation technology, and crowd source support and facilitation. Measure the impact of the eResearch on decision making and practice change. Above: CeRDI's model of eResearch follows the classic definition of using information technology to support existing and new forms of research. 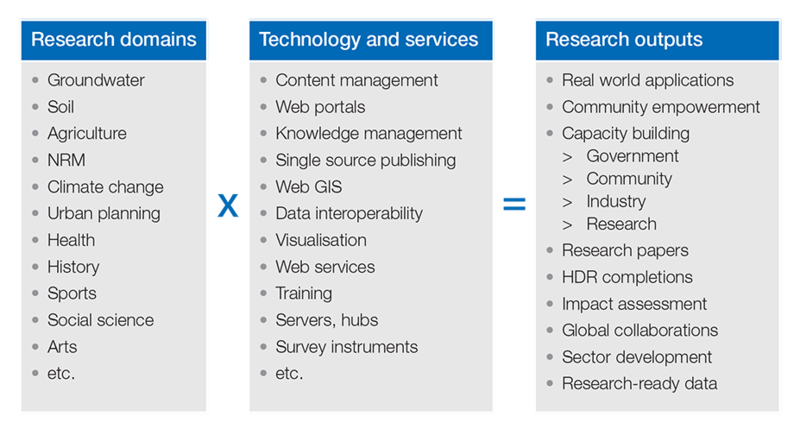 The vast majority of CeRDI’s eResearch is invested in the development of spatial data portals, as seen at: spatial.federation.edu.au. For research investors, the portals address the increasing problems of the sheer range of information sources and volume of data that is now available (i.e. in the Era of Big Data). In Australia for example, information and data on agricultural soils is distributed via dozens of web-portals, web-based GIS tools, password protected portals, cloud storage, portable storage devices; hardcopy maps, theses, reports, newsletters, documents, videos and podcasts. Outside of the research community, this impressive resource of data, information and knowledge is largely ignored simply because most people do not have the knowledge, capability or desire to deal with the data deluge. Many people feel increasingly time poor and even though there is a plethora of data available, there is little opportunity or desire to undertake the research required to bring available information together in ways that best answer the questions that will guide future planning for sustainable and profitable use of agricultural soils. To address these issues, spatial data infrastructure (SDI) has been developed and deployed to federate data from disparate database sources into a single web portal thereby making data more easily discoverable. Globally, the systems developed by Natural Resource Canada were the initial exemplars that were developed using open geospatial standards and technologies. Other examples include the European Commission's INSPIRE network, the New Zealand SMART system, and those developed by the United States Geological Survey, the French Bureau de Recherche Géologiques et Minières (BRGM), CSIRO and the Australian Bureau of Meteorology. CeRDI actively collaborates with all these organisations by sharing open source technologies and developing open standards. Seamless international information exchange of complex domain data, such as groundwater or soil data, relies on agreed formats, communication protocols and schemas for serving, querying and consuming data, along with agreed content (known as semantic interoperability). Above: The general conceptual model of the CeRDI spatial engine. The relative technical maturity of Open Geospatial Consortium (OGC) data access standards, such as the Web Feature Service (WFS) and Sensor Observation Service (SOS), combined with the rise of water data networks, created a need for an internationally agreed groundwater data exchange standard. An international interoperability experiment to develop and test a standard for groundwater data exchange, was initiated by the OGC Hydrology Domain Working Group in 2012. The imperative for the development of the Groundwater Mark-up Language version 2 (GroundWaterML2) was the need to harmonise and advance existing groundwater data modelling initiatives, such as the Canadian-USA developed GroundWaterML1, the European Union INSPIRE geology/hydrogeology package, environmental monitoring facilities and area management/restriction/regulation zones and reporting units models, and the IUGS-CGI GeoSciML geology model. The intention is that GroundWaterML2 will be adopted as the authoritative international standard for the transfer of groundwater feature data, including data about water wells, aquifers/confining beds, groundwater fluids and related entities. Five use-cases were employed in an interoperability experiment to test the proposed model. The collaborators in the interoperability experiment were the Geological Surveys of Canada, USA, Germany, UK, France and Poland, as well as the European Commission, CSIRO and the Bureau of Meteorology (Australia), the International Groundwater Resources Assessment Centre (UNESCO), University of Salzburg (Austria) and CeRDI. The proposed GroundWaterML2 standard consists of three related objects: the conceptual model—a technology-neutral UML representation of the semantics of the groundwater domain; the logical model—a GML-specific schema that incorporates the OGC suite of standards; and the XML schema—an XML encoding of the logical model. The final GroundWaterML2 model will be officially launched at the OGC meeting in Dublin in mid June 2016. 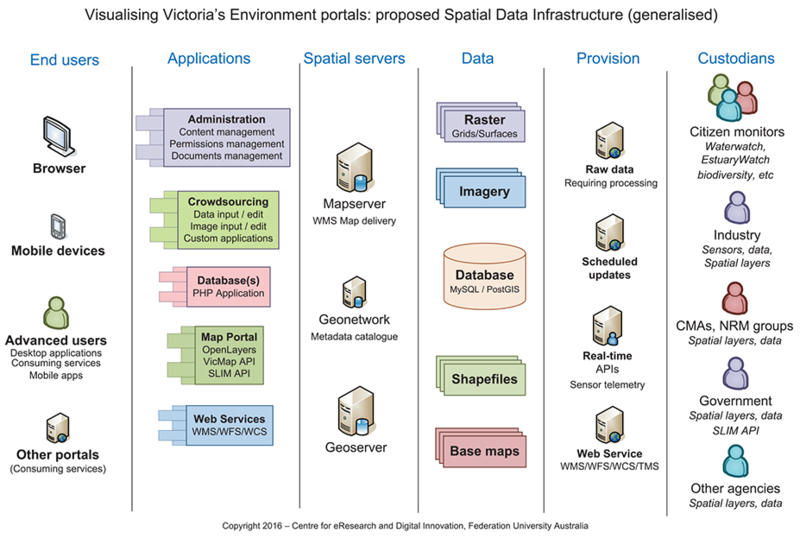 The Spatial Data Infrastructure (SDI) deployed by CeRDI was initially developed by CSIRO and is known as the Spatial Information Services Stack (SISS). At the core of the SISS are the open source spatial data engines Mapserver (www.mapserver.org) and Geoserver (geoserver.org) which are used for the Geospatial processing and service delivery using Open Geospatial Consortium (www.opengeospatial.org) standards. Vector data are commonly stored within a MySQL or PostGIS database and raster data are dynamically processed from its native format. To deliver complex web feature services (WFS), the Geoserver app-schema extension has been deployed. Geonetwork (geonetwork-opensource.org) is used as the public-facing metadata catalogue for the portals. 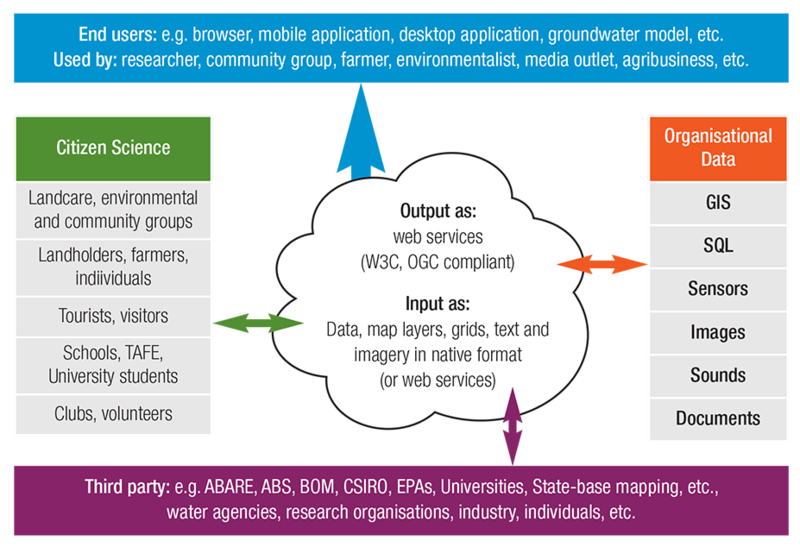 The general systems architecture and data flows from Custodians to End Users is illustrated in the Figure below (taken from Dahlhaus & Thompson, 2016: Visualising Victoria's Environment: Collaborative development of inline tools for State of Environment reporting. CeRDI Discussion paper prepared for the Office of the Commissioner for Environmental Sustainability, Victoria). Ensuring end-user tools and applications are fast, intuitive and easy-to-use. Making sure that applications work seamlessly across a variety of platforms, operating systems and browsers to the extent possible. Use of open-source and standards compliant software and technologies, wherever possible. Building upon existing collaborative software initiatives and contributing enhancements/tools back to the community. Ensuring the flexibility of the developed system to consume data from a variety of sources so as not to interfere with existing provider work practices. Use of software based in the cloud: no end-user requirement for software, updates, computation power or plug-ins. The CeRDI technical team adopts best practices for web development to ensure systems are responsive and accessible to the needs of users. The CeRDI technical team has extensive training and educational qualifications, capabilities and industry experience to ensure optimal project outputs, delivering scalable, and customised applications to meet the unique requirements of project partners. CeRDI adopts an agile path for software and spatial knowledge systems development. Rapid prototypes of products are developed in conjunction with project partners, stakeholders and researchers to ensure their technical requirements are met at each development stage.